On Wednesday SHUG lost its founding member and the heart of SHUG HQ. You may recognize John from our logo and the pics we have posted of him over the years in his role as SHUG's official nanny. Like the tortoise, John was in it for the long haul and not in any hurry to make it to the finish line. As a racer, John only ran three times before realizing his life's work was not at the track. 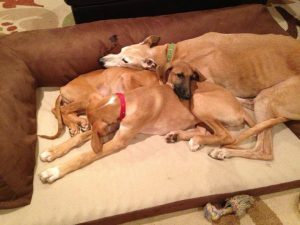 Instead, John became an ambassador for sighthounds and attended many meet and greet and adoption events. 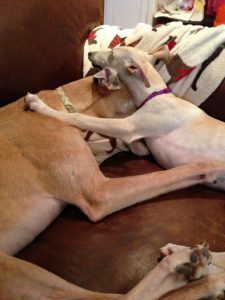 For many people over the years, John was their first exposure to sighthounds as pets. In his free time, John liked to conserve his energy with long naps and enjoyed many couch snuggles with human and furry companions of all sizes and shapes. 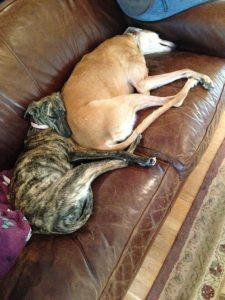 From SHUG's first rescue, little galgo puppy Mariposa from Spain, to our most recent, vision-impaired Greyhound puppy Early Bird from Kansas, Nanny John provided them all with unconditional love and met each new dog with a truly remarkable tolerance. Every dog is special, but John will always stand out for the number of lives he touched. His legac y will live on in every dog who passes through SHUG's doors. They may not know it but each of them owe him a debt--and they repay it every day by continuing his work as ambassadors for sighthounds from around the world. Thank you, John. Until we meet again. Letting go is never easy and he certainly was a very special guy. He knew you loved him so much that’s why he helped you by doing “Nanny” work, it was his way of saying “Thank You.” He’ll always live on in your heart & mind, and because of your web site all of ours. Thank you for sharing this dear boy with us. Honey and I send our deepest heart felt condolences. Hugs to you and Gussie. BeautIfully expressed! Now everyone can know just how important John was to the existence of SHUG if they did not already know. Rest freely on the Rainbow couch John!